Capital Compressor Inc., provides Industrial Air and Vacuum solutions for the automotive, production, manufacturing, dry cleaning, food & beverage, medical and dental industries. We offer 24 hour service, turn-key installations and preventive maintenance contracts. Call us today for your FREE Preventive Maintenance Inspection and Contract Quotation. Capital Compressor, Inc. has been serving the compressed air needs of Northern Virginia, Washington D.C. and Maryland since 1985. 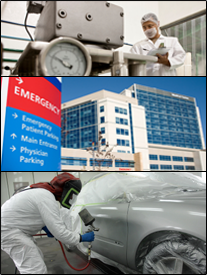 We are a full-service distributor of medical and industrial, compressed air and vacuum. We offer complete turn-key systems as well as; unit sales, service, parts and routine maintenance programs for all major brands of air compressors and vacuum pumps. Capital Compressor, Inc. also carries a full-line of air treatment products such as dryers, filters, regulators drains, and condensate management systems.